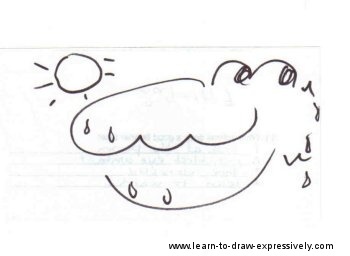 Let me tell you a story about an alligator drawing and learning to draw expressively. Power, clarity and emotion are the three "buzz" words I use when drawing. I always ask myself...am I conveying all three? Emotion doesn't only have to be expressed in the person you are drawing. In fact, it won't be unless your lines are drawn with emotion. Since my wife and I were married, she has left me a little note every morning. She would always sign off with the famous phrase, "See you later, alligator" (from Bill Haley and the Comets tune in the late 1950's). Instead of the word, alligator, she tried to draw an alligator. At first I had to ask what animal she was trying to draw. We had a few laughs and then I showed her how she might draw an alligator. She continued each day to practice her alligator drawing and at first the lines were rigid and choppy. She was trying too hard. On days when she was in a hurry, she would draw the alligator very quickly and rush out the door. These were the BEST drawings of all. Why? Because her lines were light and fluid. She wasn't thinking about it . . . she was feeling it. She even remarked one day that the expression on the alligator's face was exactly what she was feeling almost every time she drew the alligator. Now that's what I call artistic expression! She was drawing expressively without even knowing it. Here are some of the alligator drawing "after" pictures. 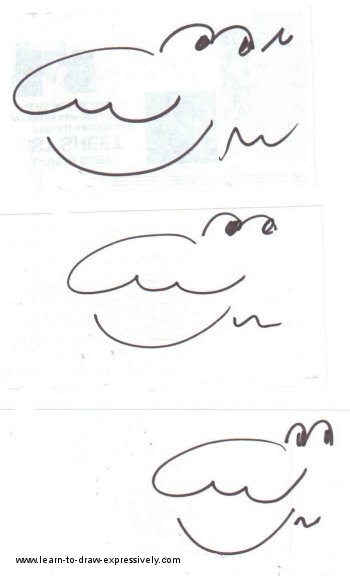 Note the spontaneity in these later drawings. It doesn't matter how simple or how complex the drawing. It is this kind of spontaneity that you want to achieve. It can be very exciting when your pencil flows freely. You will be thinking less and feeling your lines more. Here is another example. Imagine young children learning to print. They hang on to the pencil with a firm grasp, and press hard on the paper as they form each letter. They are thinking about where they want the line to start and where they want it to end up. The lines are rigid and deep (much like my wife's first alligator drawing). As time goes on, they print letters and words with little thought at all. In fact, the focus is on the word, word phrase, or sentence rather than each individual letter. Everything flows naturally. I think you get the point ... practice, practice, practice! This takes us back to the importance of gesture drawings. With practice, your hand will more easily draw what your eye sees. So get out that newsprint and your pencils and head for the gesture drawing page for a review. It may also be a good time to check out the contour line drawing page once again. Lastly, you might have a look at the simplicity of these pencil sketches, all of which were done in a very short period of time. There's nothing like the sound and feel of pencil on paper. 100,000? Don't let that number discourage you ... it won't take that many drawings to get the "feel". You can only improve from there. Return from Alligator Drawing to Learn-to-draw-expressively home.